This print is double matted, with a light beige top mat and no caption. The image size is 9 3/4" x 7 5/8". Add $10 for shipping & insurance. This print is double matted, with a brown marble top mat and no caption. The image size is 14" x 11". Add $12 for shipping & insurance. In His Constant Care illustrates Greg Olsen's ability to portray flawless architectural perspective as well as his superb treatment of texture. This painting imparts a sense of permanence, not just in the tangible elements of stone, fabric, and flesh -- he imparts this sense of permanence in the spiritual as well as the physical. 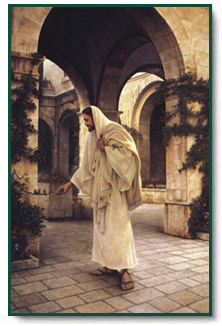 In His Constant Care copyright© 1998 by Greg Olsen.